I’m finally in the West. The South seemed endless, but yesterday I crossed over from Louisiana to Texas. Though the Census Bureau disagrees, Texans, William Least Heat-Moon, and the larger-than-life cowboy in the I-20 rest area (Marlboro Man’s cousin) all say this is the West. I’ve slept in 10 state and used a restroom or eaten a meal in another 4: Vermont, Massachusetts, New York, Pennsylvania, Maryland, West Virginia, Virginia, North Carolina, Tennessee, Georgia, Florida, Alabama, Mississippi, Louisiana, and Texas. I swear that I can tell you without reading the signs when I have crossed from one to the next. Something changes—the sense of prosperity versus struggle, the road construction, the vegetation, something intangible that distinguishes Florida-ness from Georgia-ness, North Carolinian from Tennessean. A friend riding with me speculated, “Maybe they were different to start with and that’s why the border is there.” Who knows what is cause and what is effect. I didn’t take up hiking and camping until after I moved to Vermont. 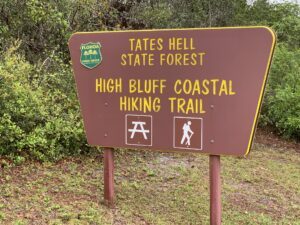 No wonder since my only Florida hike involved getting lost in a section of national forest called Tate’s Hell and walking 21 miles in sneakers. In those days, you needed a topo map to find Tate’s Hell. On this trip, I stumbled upon it’s very well-marked southern terminus. Every state park I visited now has excellent facilities and a stunning location. Sometime after I left, the state made a big investment in its unspoiled places. I look forward to returning with a kayak. My friend Marsha rode shotgun with me to New Orleans. We stopped for lunch in Apalachicola, self-proclaimed world oyster capital. When I moved away, it was a weather-beaten fishing village with a population that has been declining since 1940. Now it is an upscale weather-beaten tourist destination, though still depopulating slowly. In the olden days, a whole catfish-and-hush-puppy dinner would have lightened you wallet less than my $18 po-boy. Our highly friendly and efficient server, sporting a Coca-Cola rip-off Apalachicola tee-shirt, had the one and only deeply southern accent I heard all day. It was Saturday afternoon and well-dressed, drunken tourists were stumbling around downtown, glasses in hand, celebrating Art and Wine Walk. A man walking a golden doodle with an enormous head stopped to talk. His drunken woman friend walked away in impatient disgust. He said, “I moved here in 2003. My partner and I have three houses on St. George Island,” a barrier island off Apalachicola, barely a spit of land. West from Port St. Joe to Panama City looks like it was bombed. Six months ago, it took a direct hit from the third strongest Atlantic storm ever to reach the US mainland. Many lots are now empty where houses once stood. On even more lots, huge piles of debris await removal and half-smashed houses and hotels are peeled open and rotting like fruit. Even on a Saturday, many people were busy rebuilding in place. Pretty optimistic if you ask me. Will we all share the cost of rebuilding their houses the next time? 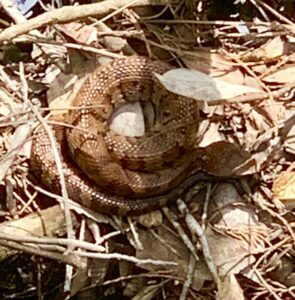 On a stormy Monday, we made a mad dash from Niceville, Florida (land of water moccasins), to New Orleans, stopping only to conduct a survey of state rest areas. I have a theory that each state attempts to convey its character through its interstate welcome centers, and where better to test this theory than passing through four southern states in four hours: Florida, Alabama, Mississippi, and Louisiana respectively. The contrast between Alabama and Mississippi was especially notable. Alabama is all breezeway and colonnade, with shady walkways connecting the reception area to the vending area to the restrooms. Then step into the Mississippi welcome center and you enter a plantation where mahogany woodwork and white women with lacquered hair and treacle accents insist that you sign the guest book. “I have two suggestions. I don’t know if they will take a tent, but I’ll check,” she says dubiously. I’m not sure why, but I seem to have the only tent in Louisiana. I wonder if they know something I don’t. “Is it wrong?” I asked. 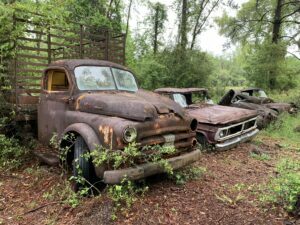 When I stepped outside, the noise from I-10 running above my head was like gunshots and I couldn’t imagine pitching my tent there, so I headed for the best kept secret in Lafayette. Except for the always-on security lights, it lived up to its quiet reputation. So much of America is homogenized from fast food to the gradual disappearance of regional accents. But the religiosity differential remains strong between the northeast and the south. I have passed through uncountable one-stop-light, 10-church towns since I crossed the Mason-Dixon line. Case in point: Winnfield, Louisiana. Leaving bayou country, I stopped there to visit the Louisiana Political Hall of Fame on my way north to Shreveport. Winnfield is a strange little town. My Vermont license plate seemed more conspicuous than it had before. I am fairly sure I saw the same cop car too many times to be coincidence. Also, Winnfielders don’t seem to understand what you do at a four-way stop. “In God we trust” is emblazoned on every police car in bigger letters than “Winnfield.” I guess they trust God to prevent T-bone collisions. The Louisiana Political Hall of Fame and Chamber of Commerce occupy the old railroad depot downtown. The director tells me in a smoker’s growl that Winnfield is the political capital of Louisiana, having produced three governors including Huey Long. Old-fashioned wood and glass museum cases line the walls. Not one, but two life-size, lifelike Longs oversee the facility (Huey and Earl). Earl even talks. Among the dozens and dozens of politicians honored in the museum, I think I counted four African Americans. The town’s other claim to fame is Uncle Earl’s Hog Dog Trials, a four-day event of national renown in which specially-trained dogs corner feral hogs for human amusement and enrichment, kind of like sheep herding trials, but less gentle. Director Carolyn assures me that the dogs are in no danger because the hogs’ tusks have been removed. But what I find most notable about Winnfield is its endless parade of churches. This town of 4,500 (down from 7,300 in 1980) has 36 churches, 20 of them Baptist. In case you were wondering, none of these houses of worship is a mosque, synagogue or Buddhist temple, but one is Catholic and one is Mormon. Throughout the south, I’ve felt welcome and found tolerance and change. 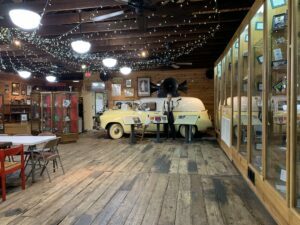 Many places, like Apalachicola and Bayou Teche, are preserving their sense of place and making a living by inviting outsiders to come and celebrate the local heritage. Unlike Vermont, I could make a cell phone call and connect to the internet everywhere in Louisiana, one symbol of connection to the larger world. But somehow Winnfield felt like that America I was afraid I’d find, and there it was, shrinking, but still with us. I admit I didn’t give it half a chance. I bought a postcard and moved on to Shreveport where I stumbled on a Creole soul food restaurant with the best gumbo in the universe. Today this must be Dallas. Kitty-corner from the Peace Church is the Prosperity Credit Union. Imagine, peace and prosperity right here in my neighborhood.